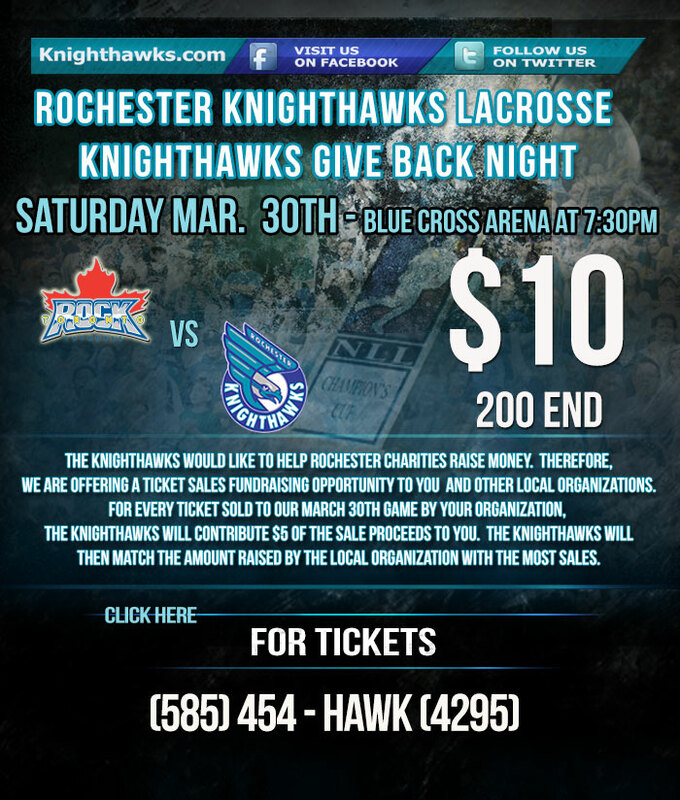 Nancy & Friend- Fighting Cancer Inc.
Rochester “Knighthawks Give Back Night” on Saturday March 30th at 7:30 at the Blue Cross Arena. Come support the Knighthawks and Muddy’s Buddies by purchasing discount tickets right here. The tickets will cost just $10 (normally $20), with $5 from every purchase going back to Muddy’s Buddies. To order tickets now, simply click on the add below, the link below or order by phone at 585-454-4295 and mention Muddy’s Buddies Promo! Youth lacrosse teams from across the county hit the field Sunday at Brighton High School for the annual Muddy’s Buddies Lacrosse Festival. The teams weren’t just playing to win in the tournament. “The kids love doing something with an extra purpose behind it like charity,” said John Stanat, youth lacrosse coach. For the non-profit group that put on the Lacrosse Festival every year there’s a greater goal off the field. “We are a group that started three years ago in memory of our brother John Lawrence,” Dr. Barbara Asselin, Muddy’s Buddies Vice President. The group, Muddy’s Buddies partners children with cancer and other chronic illnesses with sports teams across the county. The teams adopt the kids to become guest of honors at their games and events throughout the season. “Any moral boost we can give to the kids that’s trying to fight the disease we appreciate that,” said Stanat. “I think the partnership is huge and every coach and team has told this, that they got more from doing it than their buddy did, but I think it’s pretty mutual,” said Asselin. Muddy’s Buddies funds their efforts through raffles, concessions, and t-shirt sales. “We use those monies to try to provide additional help for the families, gas money and other needs they may have,” said Asselin. Muddy’s Buddies helps about 12 families annually through events like this, last year its Lacrosse Festival raised about $5000. This year they hoped to raise more. “It gets them away from some of the worries they are facing everyday whether they are at the hospital or not,” said Asselin. For volunteers like Makenzie King who played in Lacrosse Fest growing up, its a relationship that lasts long after the games are over. “When you’re little you don’t really realize it but as you grow up and see like, I helped that kid that one day, it makes you feel good,” said King, a volunteer. A group of lacrosse fans did more than catch a soggy game Sunday in Brighton; they also watched the team help out a good cause. The game supported the group “Muddy’s Buddies.” They pair children with cancer with high school varsity athletes. The children become an honorary member of the team. They go to all the practices and games and in return the team helps them through their battle. Today’s event was a chance to raise awareness and raise money. “It helps us support the family in need, the child and the family. What they are dealing with is very difficult and there are unknown costs that they can run into. So the funds allow us to support them as they go through that challenge and battle,” says Stephen Lawrence, organizer of the event. Muddy’s Buddies hopes to raise five thousand dollars. 2012 was an exciting year for Muddy’s Buddies with no signs of slowing down. We are excited to see what 2013 has to offer. We made matches with 5 new local teams and organizations. We are thrilled to continue to make both sports and non sports connections. In 2012 we facilitated our first college connection and our first pro sports connection. Thanks to Nazareth College and to Bill Sedgewick and the Rochester Rhinos! Currently, we have paired Buddies with 16 various local teams, groups and organizations from Monroe, Ontario, Genesee, and Wayne Counties. Our waiting list consists of over 50 teams and organizations awaiting Buddies! Since 2009, Muddy’s Buddies has supported more than a dozen “buddies” and their families. Muddy’s Buddies has impacted the lives of over 400 athletes, musicians and students across the Greater Rochester region. Muddy’s Buddies has inspired dozens of coaches, teachers and officials and showed the power of love and friendship to a countless number of spectators. Tailgate Parties – Muddy’s Buddies hosted two tailgate parties this fall. This is an opportunity for MB to recognize our teams, buddies, and families in the community in which they live. In addition, we are able to provide pizza, beverages and cookies to the teams/groups after a game/concert/event. If the event is a sporting event, both the home and visiting teams are invited to the party afterwards. The Buddy and his/her family are also invited. It’s a great time to celebrate the team and the Buddy for all of their hard work and dedication. Our first party was for the Byron Bergen Girls Volleyball Team. They played Aquinas and we had a great time after the game. Thanks to the Lady Bees and thank you coach Mary Powell! Our second party was for the Victor Varsity Boys Soccer Team. 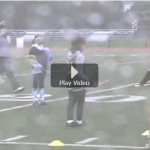 They played on a rainy, cold, Friday evening against Irondequoit. That didn’t put a damper on the party afterwards though! Thank you Team Victor and thank you coach Steve Fish! Our Buddy and his family had a great time!